A Report for the Religion and the Public Sphere Program Social Science Research Council was co-authored by CSMS faculty Hussein Rashid. Please access the full report here. In the 17th century, the need for a guide through the vast domains of Arabic literature, a "Bibliotheca Arabica," was voiced repeatedly among Europe’s Republic of Oriental Letters. One who took up the task was Johann Heinrich Hottinger. Based in Zurich, he was hopelessly removed from the necessary sources. Yet what he lacked in information, he made up with a methodology that was strikingly modern. Few dared to follow him down this path into one of the richest of the pre-modern literary traditions. Since great parts of it have remained in manuscript until today, taking stock of Arabic literary heritage and of its physical transmission through specific manuscript witnesses were often two sides of the same coin. Today, new technologies allow us to attempt a new Bibliotheca Arabica in ways that the printed page could not. This comes as scholars start to appreciate manuscripts not as necessary references but as social objects that have fascinating stories to tell. This presentation will show how to make these manuscripts, among them those in Columbia’s libraries, speak to us. Our affiliate, Zeynep Çelik was just announced as the recipient of the prestigious Giorgio Levi Della Vida Award, given to outstanding scholars whose work has significantly and lastingly advanced the study of Islamic civilization. Celebrating new books in the Arts & Sciences at Columbia University, the Heyman Center for the Humanities will host a roundtable discussion on Professor Messick’s book, Shari’a Scripts: A Historical Anthropology. A case study in the textual architecture of the venerable legal and ethical tradition at the center of the Islamic experience, Sharīʿa Scripts is a work of historical anthropology focused on Yemen in the early twentieth century. There—while colonial regimes, late Ottoman reformers, and early nationalists wrought decisive changes to the legal status of the sharīʿa, significantly narrowing its sphere of relevance—the Zaydī school of jurisprudence, rooted in highland Yemen for a millennium, still held sway. Brinkley Messick uses the richly varied writings of the Yemeni past to offer a uniquely comprehensive view of the sharīʿa as a localized and lived phenomenon. Sharīʿa Scripts reads a wide spectrum of sources in search of a new historical-anthropological perspective on Islamic textual relations. Messick analyzes the sharīʿa as a local system of texts, distinguishing between theoretical or doctrinal juridical texts (or the “library”) and those produced by the sharīʿa courts and notarial writers (termed the “archive”). Attending to textual form, he closely examines representative books of madrasa instruction; formal opinion-giving by muftis and imams; the structure of court judgments; and the drafting of contracts. Messick’s intensive readings of texts are supplemented by retrospective ethnography and oral history based on extensive field research. Further, the book ventures a major methodological contribution by confronting anthropology’s longstanding reliance upon the observational and the colloquial. Presenting a new understanding of Islamic legal history, Sharīʿa Scripts is a groundbreaking examination of the interpretative range and historical insights offered by the anthropologist as reader. This event is sponsored by The Sakıp Sabancı Center for Turkish Studies, The Columbia University School of the Arts, The Institute for Social and Economic Research and Policy, and The Department of History. “Nobel Prize-winning novelist Orhan Pamuk and award-winning plague historian Nükhet Varlık will have a conversation with historian A. Tunç Şen about how a novelist and a historian can imagine and recount past plagues. Pamuk and Varlık will share insights drawn from Ottoman plague episodes and discuss the challenges of relating these experiences in historical and fictional writing. Orhan Pamuk is currently finishing his latest novel, Veba Geceleri, set on a plague-infested Ottoman island at the turn of the twentieth century. He is the Robert Yik-Fon Tam Professor of the Humanities at Columbia University's School of the Arts. Nükhet Varlık is the author of multiple award-winning Plague and Empire in the Early Modern Mediterranean World: The Ottoman Experience, 1347-1600. She is an Associate Professor of History at Rutgers University-Newark. A. Tunç Şen is a historian of the Ottoman Empire and an Assistant Professor of History at Columbia University. Join us for a discussion and Q&A with the writers. Reproduction technologies, from chromolithography to digitization, have long been heralded as boon as to scholarship in the arts of the book. Nevertheless, bookbinding, especially that from the Muslim world, has remained at the fringes of the field. This talk examines the historical circumstances (such early modern libraries, second-hand book markets, and Orientalist scholarship) which create difficulties for the study of the art. They also, however, will offer an opportunity to reconsider the nature of manuscript culture at large. Lecture in conjunction with the exhibition "In the School of Wisdom: Persian Bookbinding, ca. 1575-1890." 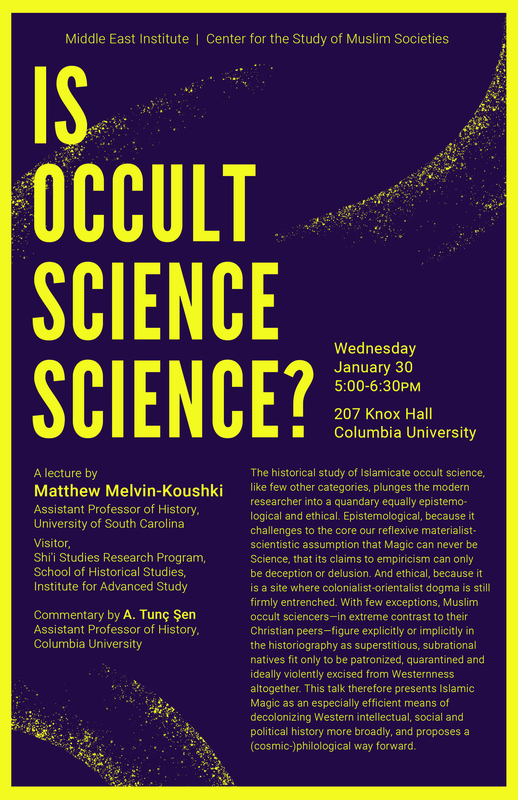 Talk will be held in Butler 523, followed by a reception for the exhibition in the Kempner Gallery, Rare Book & Manuscript Library (Butler Library, 6th Floor, East). This event is co-sponsored by the Center for the Study of Muslim Societies. "In the School of Wisdom: Persian Bookbinding, ca. 1575-1890." Chang Octagon Room, Rare Book & Manuscript Library, Butler Library, 6th Floor, East. Free, handicapped accessible, and open to the general public. Exhibit hours are the same as the RBML service hours. You must have photo ID to enter the building. Please see Directions for more information. Since Edward Said’s foundational work, Orientalism has been singled out for critique as the quintessential example of Western intellectuals’ collaboration with oppression. Controversies over the imbrications of knowledge and power and the complicity of Orientalism in the larger project of colonialism have been waged among generations of scholars. But has Orientalism come to stand in for all of the sins of European modernity, at the cost of neglecting the complicity of the rest of the academic disciplines? In this landmark theoretical investigation, Wael B. Hallaq reevaluates and deepens the critique of Orientalism in order to deploy it for rethinking the foundations of the modern project. Refusing to isolate or scapegoat Orientalism, Restating Orientalism extends the critique to other fields, from law, philosophy, and scientific inquiry to core ideas of academic thought such as sovereignty and the self. Hallaq traces their involvement in colonialism, mass annihilation, and systematic destruction of the natural world, interrogating and historicizing the set of causes that permitted modernity to wed knowledge to power. Restating Orientalism offers a bold rethinking of the theory of the author, the concept of sovereignty, and the place of the secular Western self in the modern project, reopening the problem of power and knowledge to an ethical critique and ultimately theorizing an exit from modernity’s predicaments. A remarkably ambitious attempt to overturn the foundations of a wide range of academic disciplines while also drawing on the best they have to offer, Restating Orientalism exposes the depth of academia’s lethal complicity in modern forms of capitalism, colonialism, and hegemonic power. The relationship between Islam and feminism is complex. There are many Muslim scholars who fervently promote women’s equality. At the same time, there is ambivalence regarding the general norms, terminology, and approaches of feminism and feminist theology. This ambivalence is in large part a product of various hegemonic, androcentric, and patriarchal discourses that seek to dictate legitimate and authoritative interpretations. These discourses not only fuel ambivalence, they also effectively obscure valuable possibilities related to interreligious feminist engagement. In this lecture, Dr. Rhodes will discuss her new book – Divine Words, Female Voices: Muslims Explorations in Comparative Feminist Theology (Oxford University Press, 2018) – which argues that interreligious feminist engagement is both a theologically valid endeavor and a vital resource for Muslim women scholars. She will discuss how comparative feminist theology leads to new, constructive Muslima and Islamic feminist positions on topics including revelation, scripture, feminist exemplars, theological anthropology, and ritual practice. Jerusha T. Rhodes is Assistant Professor of Islam and Ministry at Union Theological Seminary in the City of New York. Her research focuses on theologies of religious pluralism, comparative theology, and Muslima theology. She also serves at the Director of Union’s Islam, Social Justice, and Interreligious Engagement Program. From classical figures such as Avicenna to the twentieth-century Sufi master and teacher of tolerance Tierno Bokar Salif Tall, Diagne explores how Islamic thinkers have asked and answered such questions as, Does religion need philosophy? How can religion coexist with rationalism? What does it mean to interpret a religious narrative philosophically? What does it mean to be human and what are human beings’ responsibilities to nature? Is there such a thing as an “Islamic” state, or should Muslims reinvent political institutions that suit their own times? Diagne shows that philosophizing in Islam in its many forms throughout the centuries has meant a commitment to forward and open thinking. A remarkable history of philosophy in the Islamic world as well as a work of philosophy in its own right, this book seeks to contribute to the revival of a spirit of pluralism rooted in Muslim intellectual and spiritual traditions. Associate Professor at the Buchmann Faculty of Law, Tel Aviv University, and currently a Visiting Fellow at the Shelby Cullom Davis Center, Princeton University. Her research concerns Islamic and Jewish jurisprudence in both historical and contemporary legal systems. It is with profound sadness that we announce the passing of Professor Ehsan Yarshater on September 2, 2018 in Fresno, California. Endowed with a rare combination of a bold and broad scholarly vision, immense erudition, and unfailing determination, Professor Ehsan Yarshater transformed Iranian studies, creating an enduring legacy at Columbia University which advanced the scholarship and understanding of the histories, cultures and accomplishments of Iranian peoples. Register for Foundation to Islamic Studies and Muslim Societies. This seminar provides students with an introduction to key concepts, theories and debates in Islamic Studies, broadly conceived. Required for students in the Islamic Studies Master of Arts program, this course is also suitable for graduate students in other departments who study the Middle East, South Asia and Africa or are interested in Islam. With weekly guest visits by faculty, Foundation offers students a unique opportunity to learn directly from scholars from across disciplines and schools at Columbia. Qualified undergraduates may register with permission of Kathryn Spellman. 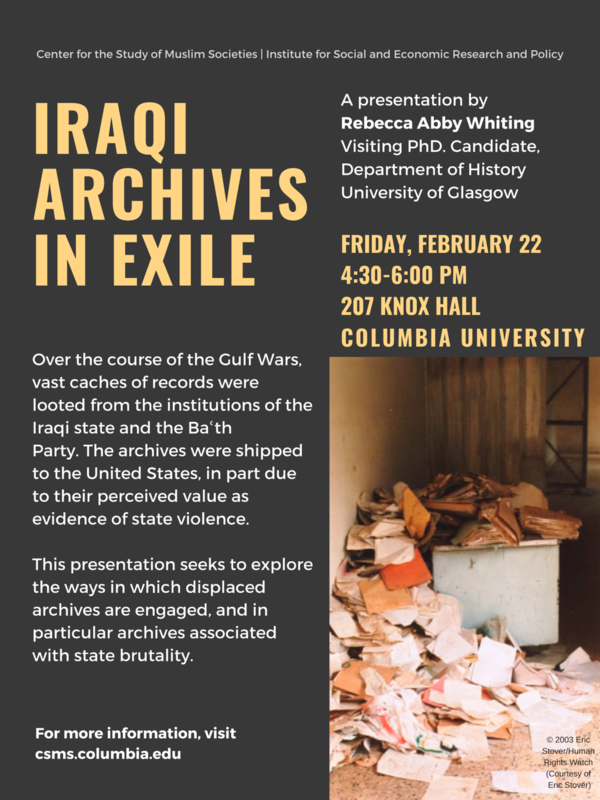 Kathryn Spellman is Visiting Associate Professor at the Middle East Institute and the Academic Program Director of the Islamic Studies Master of Arts (ISMA) program at Columbia. She is Associate Professor at the Institute for the Study of Muslim Societies at the Aga Khan University. Open to the public, please register. Registration will reopen on Sep 5th at noon. Following the introduction of lacquer-painting in the 15th century, bookbindings became a rejuvenated site for creative expression in Iran. ‘In the School of Wisdom’ presents over thirty examples, representing the diversity of the art as it developed from the late Safavid to Qajar eras and contextualizing it within a changing landscape of libraries and book culture. Reception to follow in the Stronach Center. Physician turned artist, Ahmed Mater is one of the most significant cultural voices documenting and scrutinising the realities of contemporary Saudi Arabia. Forging an ongoing, complex mapping of the Kingdom, his practice synthesises and documents collective memories to uncover and record unofficial histories. The temporal and physical breadths of his research-led inquiries are sharpened by the incisive gaze of his conceptual works. With this scope, Mater imagines and forecasts possible prognoses for a land of unprecedented religious, social, economic and political influence. This event is part of the series, "Disrupting Unity and Discerning Ruptures," organized by Avinoam Shalem, Riggio Professor of the History of the Arts of Islam in the Department of Art History and Archeology. His main field of interest concerns artistic interactions in the Mediterranean basin, migration of objects, and medieval aesthetics. He has published extensively on medieval Islamic, as well as Jewish and Christian art.